This ZP9B rotary tablet press machine is designed by KOS Company. This ZP9B Rotary Tablet Press Machine is well applied to press milk chewables, effervescent tablets and calcium tablets. 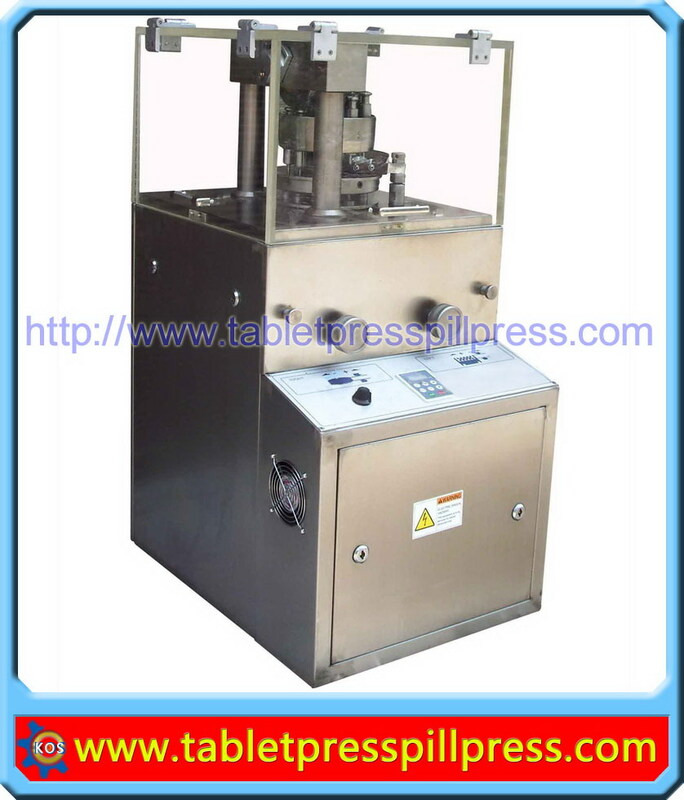 ZP9B is a single-press type continuous automatic rotary tablet press machine. It can press tablets, coal, sugar, calcium tablets, coffee pills and other granular and powder materials, therefore it is widely used in pharmaceutical,chemical,food,commodity, electronic and other industries. There are 9 sets of punch dies working on the machine, so that the efficiency and capacity will largely improve. Due to the 60kn pressure, the machine is good at pressing hard irregular shaped tablets such as all kinds of chewables, effervescent tablets and calcium tablets. In addition, this machine is made of high-quality stainless steel which is not easy to get rusty and the side panels can be opened so it’s also easy to do the cleaning and maintenance. 1.Easy to install, use,and maintain. 3.Excellent performance, high efficiency and great productivity. 4.Large pressure and high precision. 5. Largest pressure up to 60kn, biggest diameter of tablets up to 20mm. This price is for one set ZP9B rotary tablet press machine with free DHL shipping.We can help you import this machine and pass custom with broker service, but you need to prepaid 1000USD for custom broker/custom clearance/tax etc. If needed please contact us.